Canine Joint Problems Solved, Naturally. Glucosamine and Chondroitin have been used to treat osteoarthritis throughout the world for over thirty years. Recently, veterinarians in the United States have started to turn to these compounds for their patients and have been extremely happy with the results. These products are proving to be one of the safest and best treatments for the crippling effects of osteoarthritis that affects millions of aging dogs. There are many different joints that can be affected by osteoarthritis in the dog, but by far, the most common is the hip joints. Hip Dysplasia is very common in many of the larger breeds of dogs. This condition greatly exacerbates the normal wear on the smooth cartilage protecting the bony surface of the joint. When this cartilage wears away there is a bone to bone contact, which creates the pain seen with arthritis. Even dogs that do not have hip dysplasia may have a decrease in this cartilage as they age, and will show signs of arthritis. In addition, aging dogs may also have arthritis in their knees, elbows, and shoulders and cartilage loss or damage that respond to glucosamine and chondroitin. Where are glucosamine and chondroitin found? Glucosamine and chondroitin are normal substances found in the body of living animals. They are at their highest concentration in cartilage. Unfortunately, through degradation during digestion and processing, almost all of the glucosamine in an animal's diet is unavailable for use. The body, therefore, synthesizes most of its own glucosamine through a biochemical reaction utilizing glucose. In normal healthy animals the body is able to synthesize enough glucosamine to keep the existing cartilage healthy, but when the animal ages or there is damage to joint cartilage it cannot produce enough to keep up with the body's needs. This is where a supplemental form of glucosamine is needed. Glucosamine provides the building blocks to synthesize new cartilage. In a nutshell, cartilage consists of several different cells, one of which is chondrocytes. Chondrocytes are responsible for synthesizing new cartilage. Through normal wear, cartilage is constantly being broken down and replaced. When a dog has hip dysplasia or ages, the chondrocytes do not have the building blocks available to them to build enough new cartilage to keep up with the breakdown of the old cartilage. Glucosamine provides the building blocks to synthesize new cartilage, called glycosaminoglycans. The glycosaminoglycans are combined with hyaluronic acid to make the substance proteoglycans. The proteoglycans and collagen are the main structures of cartilage. Chondroitin blocks destructive enzymes that break down cartilage in the joint. Chondroitin also is one of the products necessary for the synthesis of glycosaminoglycans. But it probably plays a more important role by combating and neutralizing destructive enzymes in the joint. There is always a low level of destructive enzymes found in the joint, but when injury or abnormal wear occurs, the destructive enzymes and agents increase accelerating cartilage destruction. When chondroitin is added to the diet it helps to reduce the level of these destructive enzymes. 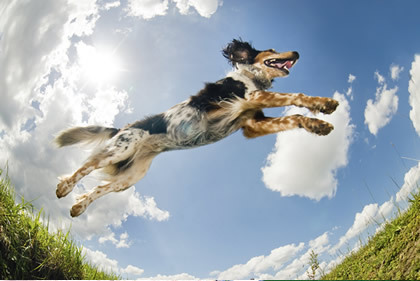 While almost every canine joint supplement uses a synthetic form of glucosamine and chondroitin, HardyPet has chosen the natural forms which have higher bioavailability, provide better glycosaminoglycan conversion, and do not contain the harmful substances normally associated with synthetics. Glucosamine: A 2-amino derivative of glucose which is obtained through the hydrolysis of chitin, a polysaccharide found in the shell of crustaceans. HardyPet formulas contain natural glucosamine found in Refined Oyster Shell. Chondroitin: A naturally occurring product found in animal cartilage. HardyPet formulas contain natural chondroitin found in premium Shark Cartilage. The use of natural ingredient forms whenever possible, and the precise combination of other synergistic compounds, make HardyPet Complete the best holistic option for dogs with Osteoarthritis, breeds that are prone to hip dysplasia, and all breeds suffering from age related mobility issues.